LONDON – Catholic actor Liam Neeson said he thinks the magical lion of C.S. Lewis’ “The Chronicles of Narnia” series not only represents Christ but also symbolizes other great spiritual leaders. Neeson is the voice of Aslan the lion in “The Voyage of the Dawn Treader,” a 20th-Century Fox film premiered for journalists in London Nov. 30. It will open in U.S. theaters Dec. 10. At a Dec. 2 news conference, Neeson explained what the character meant to him. “Yes, Aslan symbolizes a Christ-like figure, but he also symbolizes for me Mohammed, Buddha and all the great spiritual leaders and prophets over the centuries,” he said. “That’s who Aslan stands for as well as a mentor figure for kids – that’s what he means for me,” he added. Walter Hooper, C.S. Lewis’s former secretary and a trustee of his estate, disagreed with Neeson’s assessment. “Lewis would have simply denied that,” said Hooper, an American Catholic who lives in Oxford, England. 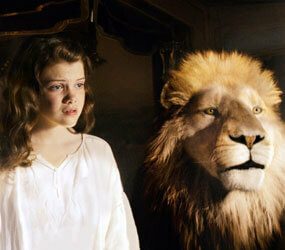 But Georgie Henley, 16, who has played the character of Lucy Pevensie in the “Narnia” movies, defended her co-star. She said Neeson had not discussed his interpretation of Aslan with any of the cast, but they were “very excited” to hear his remarks during the news conference. “I can see where he is coming from,” said Henley. “Aslan represents more than Jesus or God for a wide range of people,” she told CNS in a Dec. 2 telephone interview. “He can be the epitome of wisdom or the epitome of courage, for instance, and it is very important that people can have their own interpretation of what he represents rather than have something forced upon them,” she said. Clive Staples Lewis, a native of Belfast, Northern Ireland, wrote the seven books of “The Chronicles of Narnia” between 1949 and 1954 and the books have since sold millions of copies around the world. The series is infused with Lewis’s thinly veiled Christian beliefs: The climax of “The Lion the Witch and the Wardrobe,” first of the books, sees Aslan sacrificing his life to save Narnia from the grip of the evil white witch before rising triumphantly from the dead. The themes of “The Voyage of the Dawn Treader,” the third of the books to be made into a film, involve the Christian themes of temptation, sin and redemption. The story follows the adventures of Edmund and Lucy Pevensie and their obnoxious cousin, Eustace Scrubbs, as they sail to the end of the world in search of seven missing Narnian lords. Throughout their journey, the mysterious presence of Aslan guides the children, helping them to avoid evil and to do good, and heals them on the occasions when they succumb to temptation. Neeson, who comes from Ballymena in County Antrim, Northern Ireland, also gave his voice to Aslan in the earlier two Narnia movies: “The Lion, the Witch and the Wardrobe” in 2005 and “Prince Caspian” in 2008. He has spoken publicly of his admiration for “The Spiritual Exercises of St. Ignatius of Loyola,” written by the founder of the Jesuits. Neeson also has starred in the roles of such historically significant Catholics as the Irish revolutionary leader Michael Collins, the Scottish rebel Rob Roy MacGregor, and Oskar Schindler, the German entrepreneur who save scores of Jewish lives from the Holocaust.